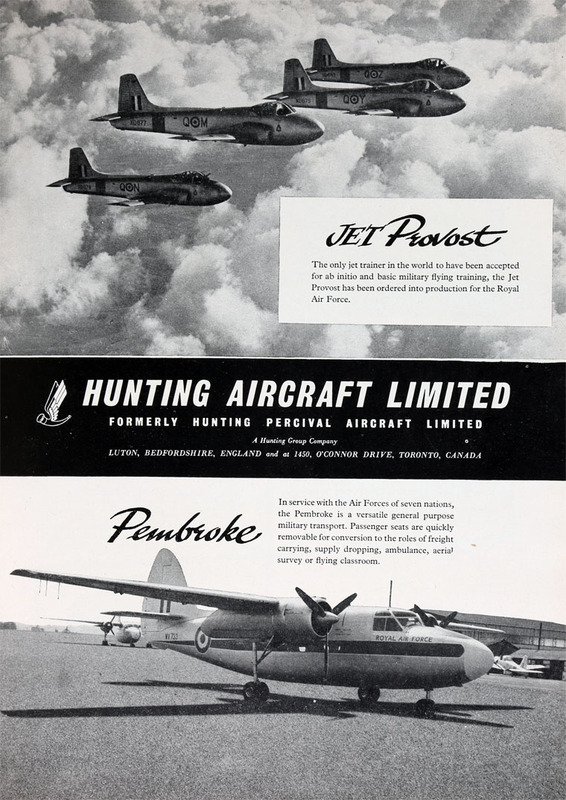 Hunting Aircraft was a British aircraft manufacturer, primarily producing light training aircraft, of Luton. 1936 Restructured as Percival Aircraft Ltd, and moved to Luton. Private company. The twin-engined Prince feeder liner was very successful, being adapted for a variety of other roles such as air survey (such as with Hunting Aerosurveys Ltd), training, and communications work with the RAF, the Royal Navy, and various foreign and Commonwealth air forces. Hunting Percival produced a series of primary training aircraft for the Royal Air Force, culminating in the Jet Provost. 1960 Hunting Aircraft was engaged in a design study which was eventually to emerge as the BAC One–Eleven jet airliner. 1961 Aircraft designers and manufacturers, producing the Jet Provost trainer. 2,000 employees. This page was last edited on 11 December 2015, at 14:15.